75,000 and over | What Car? There's a school of thought that the current-generation Porsche 911 is too civilised for its own good. If that's a view you subscribe to, meet the 911 GT3: if the standard car is civilised, this is the barbarian at the gates. In place of the regular 911's 3.6-litre engine, the GT3's engine has been enlarged to 3.8 litres, pushing power up to a formidable 429bhp. Just as importantly, there's more muscle in the mid-range and the engine sounds more exciting than the standard car's. We can't see owners using the radio too often. Performance is phenomenal. 911s are always quick off the line, partly thanks to the weight of the engine sitting over the rear wheels, but the GT3 is savagely fast hitting 62mph from a standstill in 4.1 seconds. The GT3 makes you work to get the most from it. The gearchange is heavy and needs a firm guiding hand, but there's something very satisfying about feeling the cogs mesh. It's the same with the way the car handles there's nothing to isolate you from the physical sensations of driving. Changes of direction are instant, the steering telepathic, and grip is so strong you'd think the GT3 ran on racing slicks not road tyres. 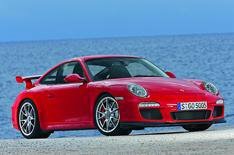 The GT3 is a 911 in the raw, and is all the better for it. James Bond might have trashed his Aston Martin DBS in the first few minutes of Quantum of Solace but, if you're fortunate enough to own one, we imagine you'll want to look after it a little better. If the elegant-yet-aggressive looks don't have you hooked, the V12 engine will. With 512bhp it punches the DBS from 0-62mph in just 4.3 seconds, and it sounds like nothing else you've heard before. Some rivals are even quicker, but they're not as civilised as the Aston. The superb handling and comfortable ride make this one of the world's best GT cars. We thought Audi would struggle to improve on the R8 V8 but it has with the new V10. It isn't just quicker, although with an extra 100bhp it's considerably more rapid than the V8. Throttle response is sharper, the engine revs higher, and the soundtrack is utterly addictive, especially the change from low-down rumble to high-pitched wail. Everything that's always been so great about the R8 is still true with the V10. Four-wheel drive means you can make the most of the performance in all weathers, and it has a handling balance that makes some supercars feel clumsy. It's as straightforward to drive as any other Audi , too, and it's a surprisingly easy car to live with. With four seats and a large boot, this is as practical as supercars get. The Bentley Continental GT is effortlessly imposing as well as being effortlessly quick, thanks to the astonishing W12 engine. The Speed model is the one to go for. With its more sporting suspension, it does a better job of making the most of the W12 engine than the standard car manages to do. Close to 200,000 is a huge amount of money, but then the Ferrari 599 GTB is a huge achievement. If the Tarmac starts to twist and turn, you'll be amazed by how agile such a big car can be. On the straights, you'll be blown away by the astonishing power of the V12 engine. Most Ferraris are driven on high days and holidays, but the Fiorano is practical and comfortable enough for you to use every day. The ride is firm, but not harsh, and there's plenty of space for two. It has a good-sized boot as well. This Ferrari is both a supercar and a long-distance GT all at once. Maybe we need to bring in a sixth star that's how good the Ferrari Scuderia is. The standard F430 is a pretty special car in itself, but the Scuderia version takes all the things that are best about it, and then turns it up a notch. With more power and less weight, it hits 60mph in just 3.6 seconds, but the raw figures don't do the car justice. It's not what the Ferrari does that makes it so special, but the way it does it. Throttle response is as sharp as an electric shock, and the handling shows the balance of a tightrope walker. As Ferris Bueller once said: if you have the means, we highly recommend picking one up. The SL500 is so good, there's little point in paying the premium for one of the more expensive SLs not that you could reasonably call any SL cheap. The SL500 is worth it, though. The folding-metal roof makes the Merc as good a coup as it is an open-top. The same dual personality runs through the rest of the car. The V8 engine delivers performance and refinement in equal measure, while the chassis is as rewarding on a twisting road as it is comfortable in town. The SL's mid-life face-lift arguably made the car less good looking, but that's about the only bum note the Merc plays. If cars drove as well as they looked, the Maserati Granturismo would be the best car in the world. It's so gorgeous, passers-by will end up walking into lampposts. If the driving experience isn't quite as exceptional as the styling, it's still very good indeed. The ride is supple and the steering is well weighted and precise, and there's cornering grip to burn, too. Go for our favourite version, the S, and the V8 engine produces a massive 431bhp. Performance is astonishing as well, so long as the revs stay above 3000rpm. The fact that there's enough space for four only makes this beautiful car more appealing. More than a quarter-of-a-million pounds for a car. Can the Rolls-Royce Phantom justify the incredible price? By any objective measure, no a Mercedes S-Class is quieter at speed for a fraction of the cost. Then again, what makes the Phantom special can't be measured by a decibel meter. The cabin is luxurious, with acres of space, a forest of wood and whole herd's-worth of leather. Bumps in the road are smoothed by the suspension, yet when it's the chauffeur's day off you'll enjoy driving the Phantom.